Which of the following has a cup shaped chloroplast? A small, actively moving little alga, chlamydomonas commonly inhibits quiet, fresh-water pools and typically represents green algae (chlorophyta). 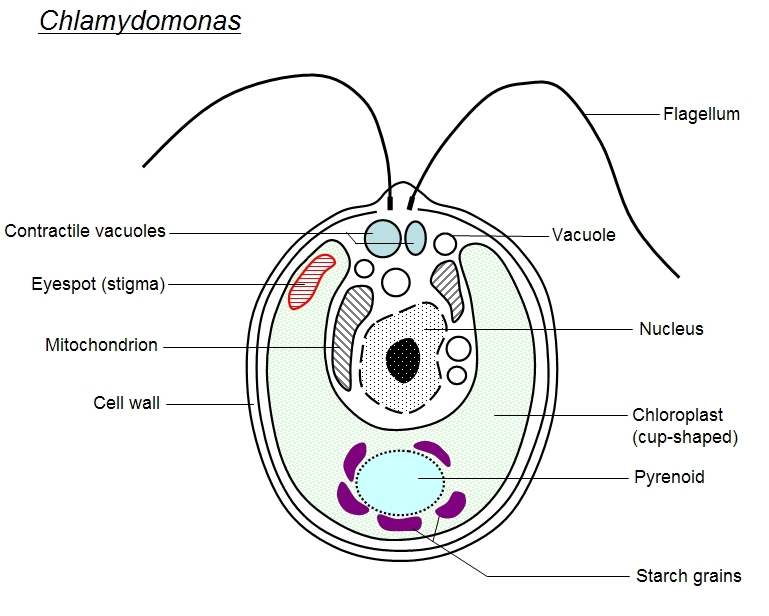 A dominant feature of each chlamydomonas is a single, usually cup-shaped chloroplast at least partially hiding the centrally located nucleus. One or two roundish pyrenoids are located in each chloroplast. Pyrenoids are protein structures thought to contain enzymes associated with synthetic starch. Most species also have a red eyespot on the chloroplast near the base of the flagella. The eyespot is sensitive to light; it is, however, merely part of an organelle within a single cell and is in no way complex and multicellular like an eye. The Genesis of Germs: The Origin of Diseases and the Coming Plagues By Alan L. Gillen, Page no: 65.